Teaching food vocabulary it is the right moment to introduce a crucial nutrition rule: FIVE-A-DAY portions of fruit or vegetables. 3. Introduce five-a-day nutrition rule and ask children to make their own projects to picture this good habit. Students write a big 5 in the middle of the paper. 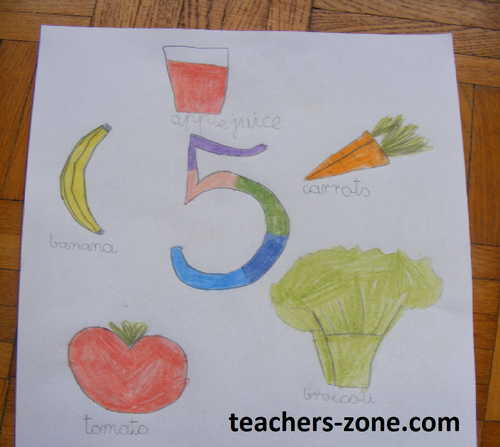 Then they draw five fruit or vegetables (juice is also possible) they like and label them. Finally, children decorate the five number and colour their five-a-day. 6. Stick ready projects to the board. 7. Fast finishers can do additional tasks. 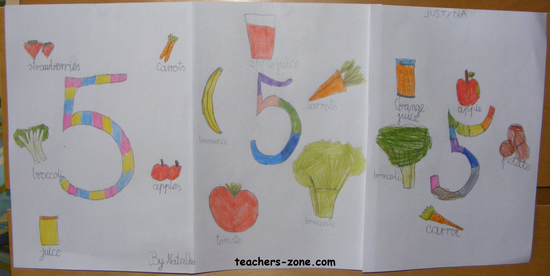 Print fruit worksheets or vegetables worksheets . You can use some of them as a homework as well.